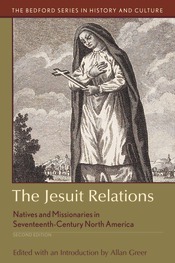 As a 73-volume library, the original Jesuit Relations has long been inaccessible to undergraduate students. Vitally important, the writings of seventeenth-century French Jesuits in Native North America tell the story of early American encounters. This new edition deftly binds them into a thematically arranged, 35-document sampler with a detailed introduction that provides background on these missionaries, the Native Americans, and their cohabitation in early North America. Colorful journal entries by such fathers as Paul Le Jeune, Jean de Brébeuf, Claude Dablon, and Claude Allouez describe the Wendat, Algonquin, Iroquois, and Innu peoples. Changes to this edition include recent scholarship in the Introduction, chapter notes, and bibliography, as well as a new chapter which recounts the early stages of the Jesuits’ westward expansion into the region of Lakes Superior and Michigan and the upper Mississippi valley, and sheds light on the anti-Iroquois alliance that was taking shape in the late 1660s. Two maps, a chronology, a bibliography, and questions for consideration supplement the firsthand accounts.